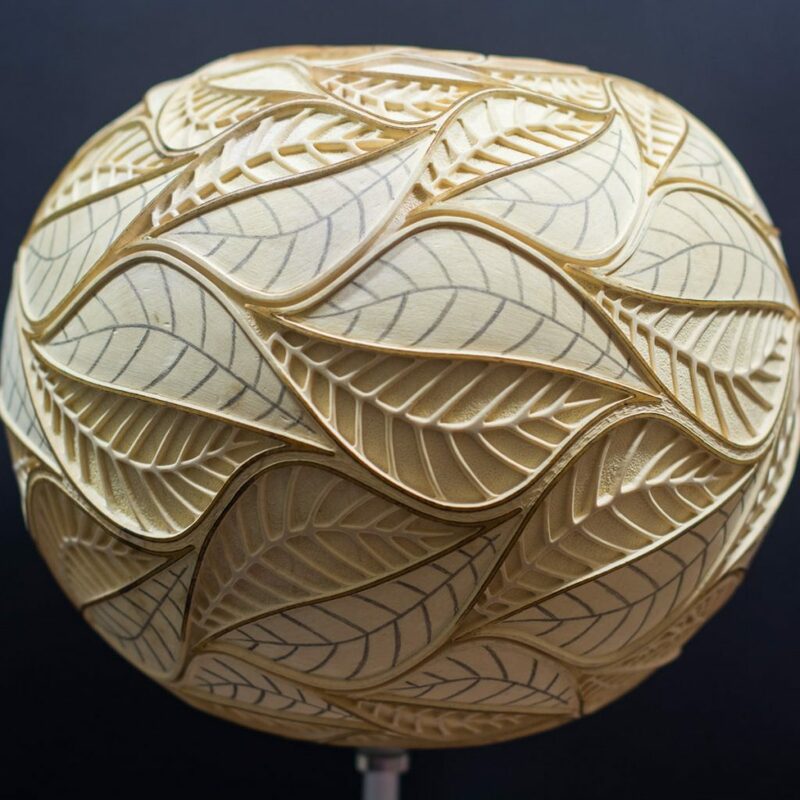 My Table lamp XXVII Escher’s Leaves was probably the most challenging and labor-intensive of all my lamps. 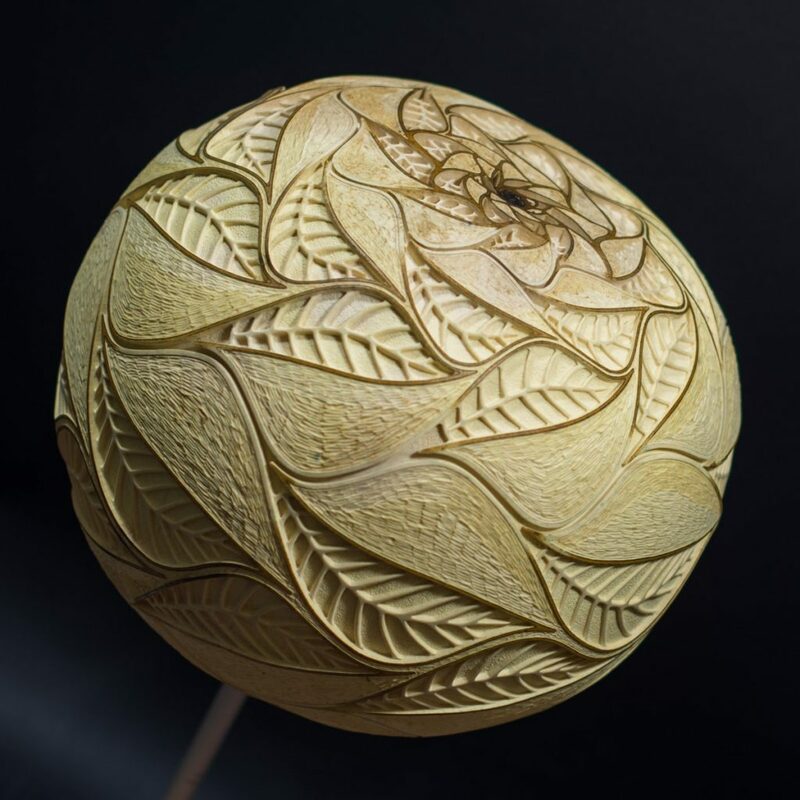 In this post, I will present more details and pictures from the process of creating this unique, handcrafted, organic lamp. As for the beginning, you can watch this short video. 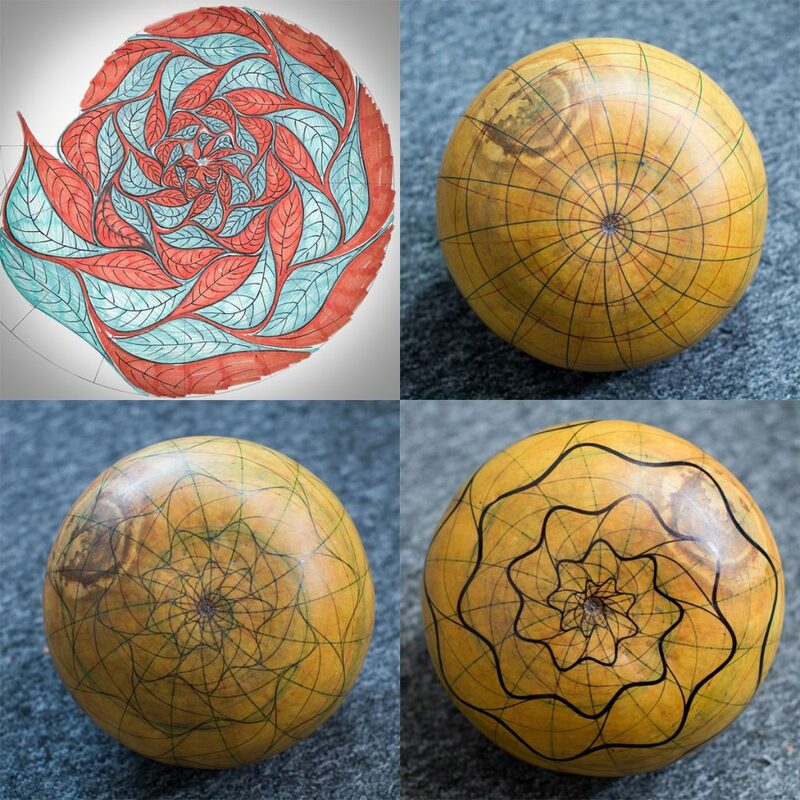 For about 5 months, on every stage of work, I recorded the rotating gourd from the same angle, with the same exposure and speed. 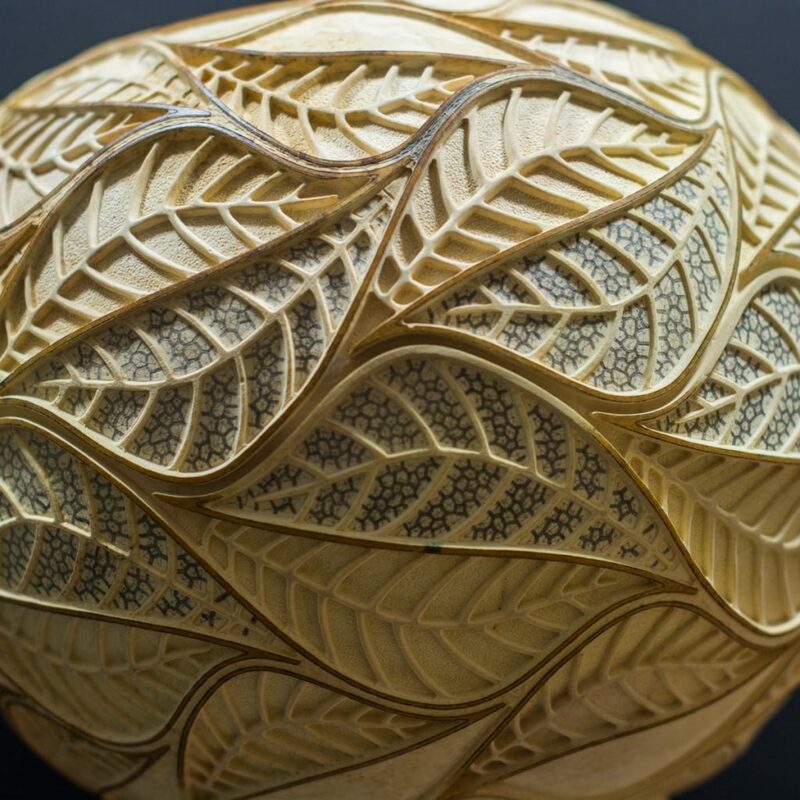 In the end, all videos were edited into one, showing how the gourd has become the unique piece of art – the “Escher’s Leaves”. Although the original work of M.C. 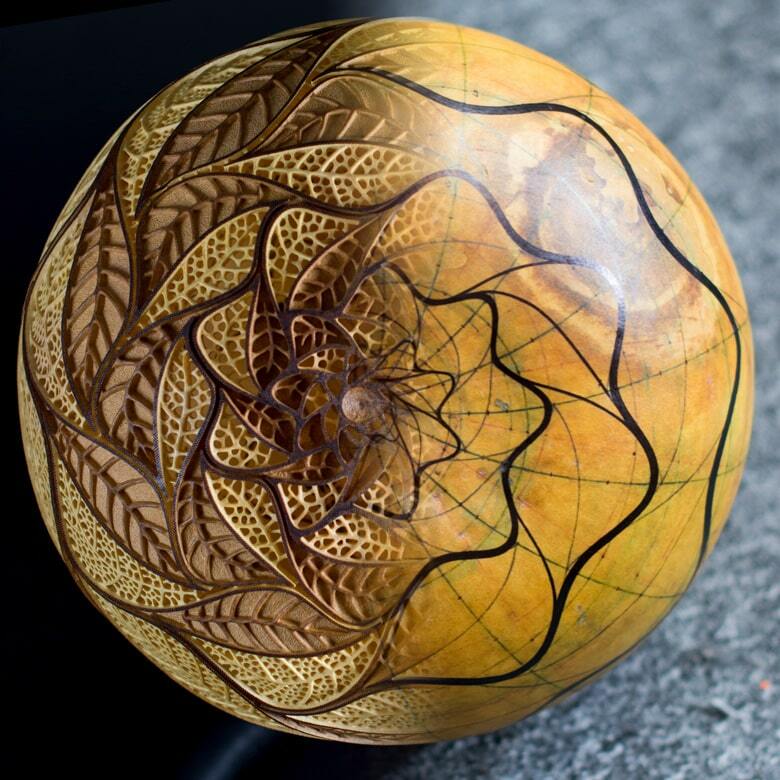 Escher was built on a rectangular grid, I have built the leaf design on the spherical (that is obvious), spiral grid. My aim was not to just copy the Escher’s pattern but to create something new, an organic design – a kind of tribute to this genius graphic artist. 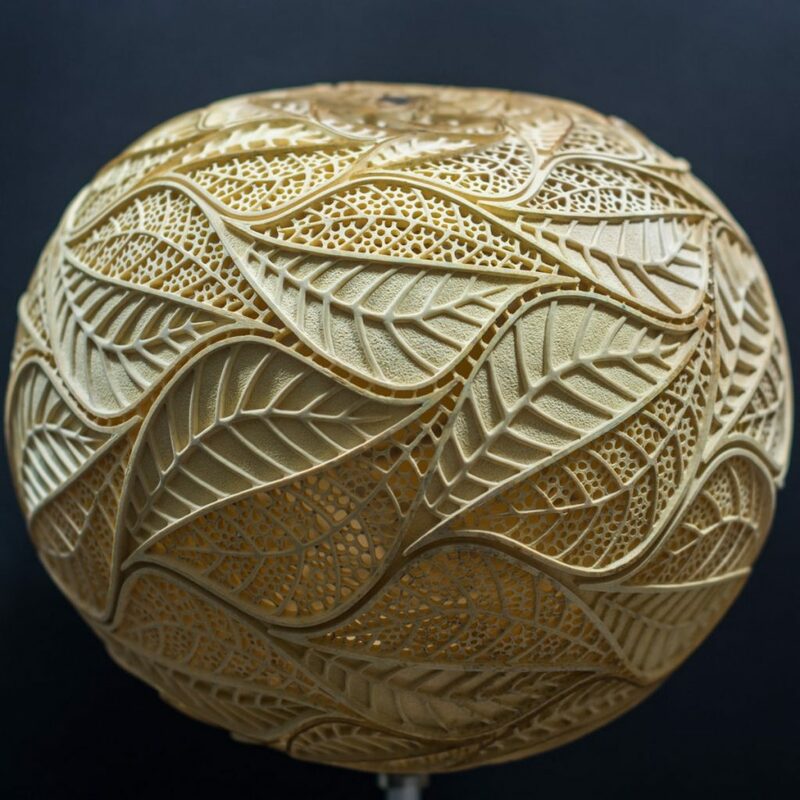 Although most of my designs I project directly on the gourd, this time I had to first make several drawings to design this pattern and create evolving, symmetrical and continuous leaf forms being in perfect balance. 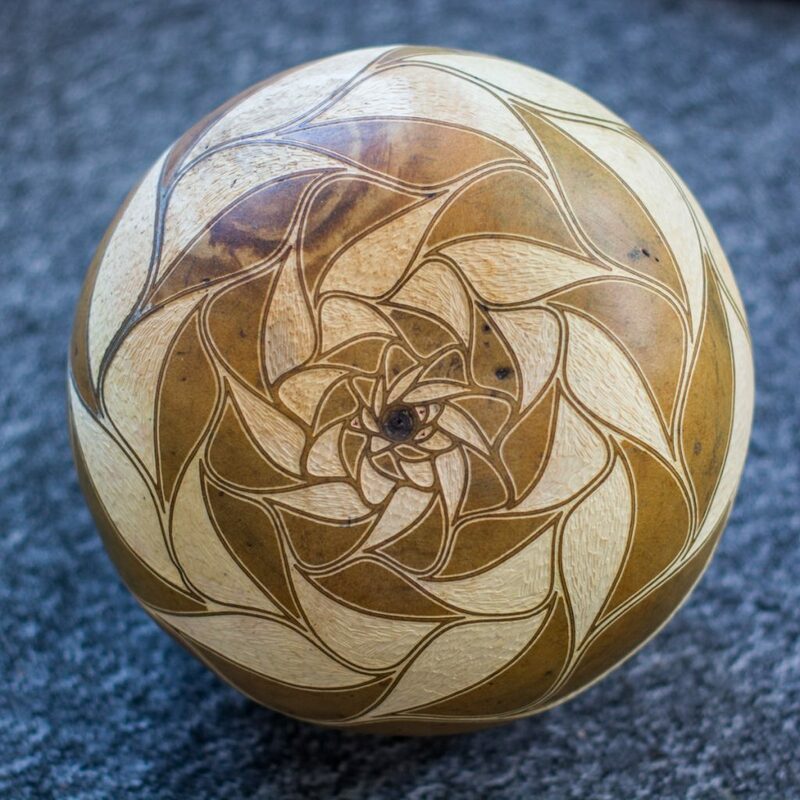 Sorry for jumping over the stage of the drawing the pattern on the gourd, but I simply forgot to take a picture of that stage. Besides, I would like to focus more on the carving process. 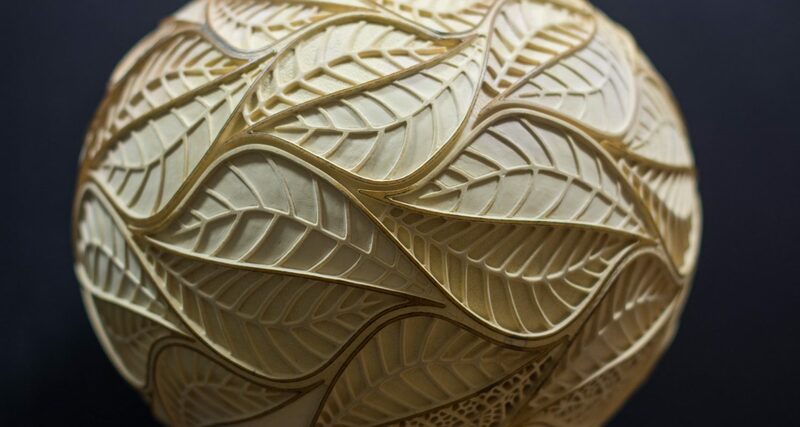 After engraving all the contours, the first part I was carving were the leaves without perforation. 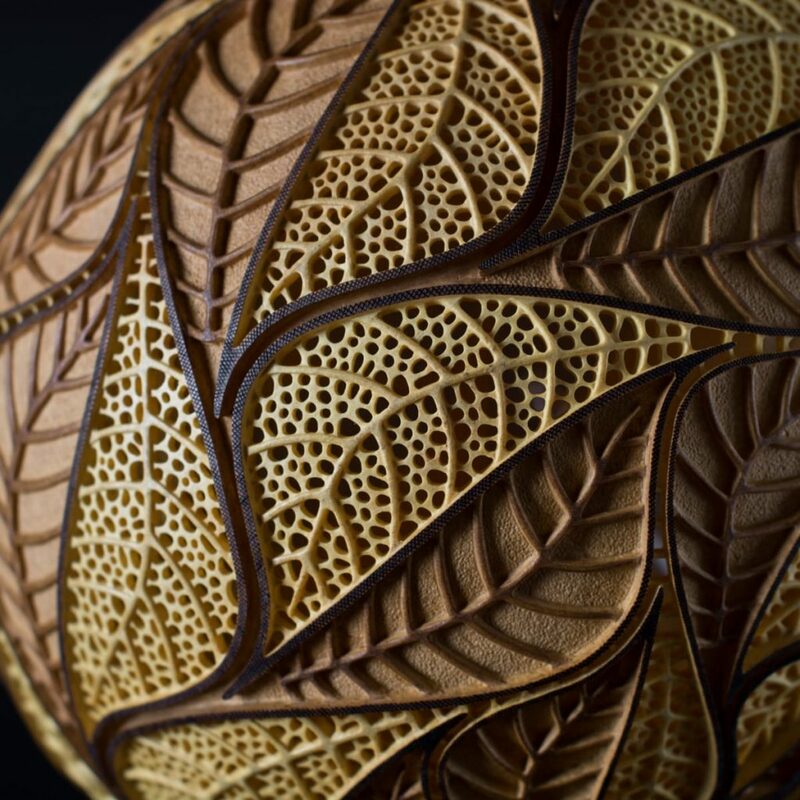 Now, was the time to carve another part of the pattern – the leaves with the perforation. 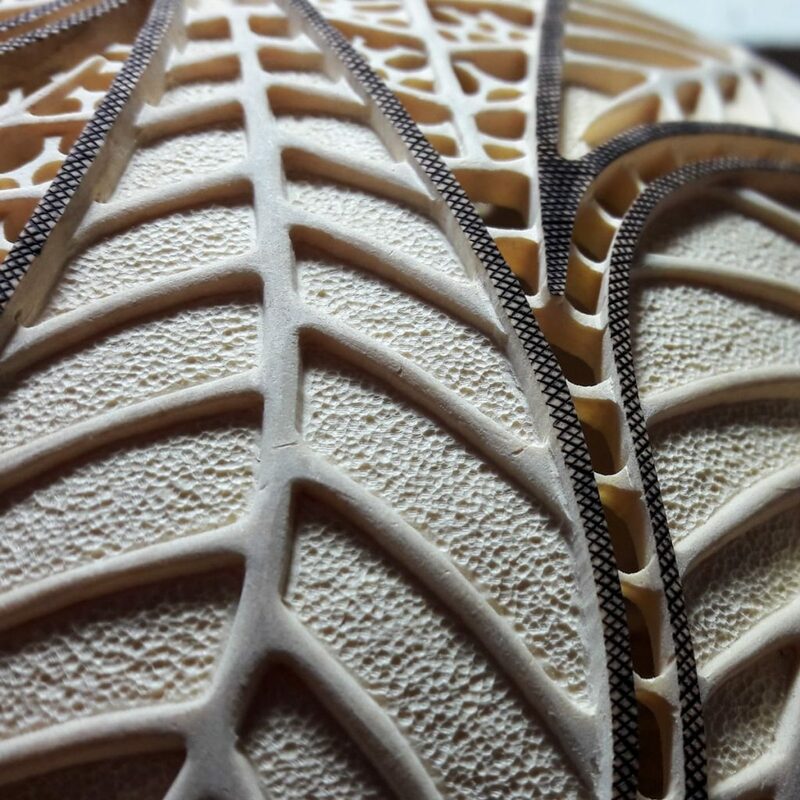 The first stage – carving the veins – was similar like in the first part. 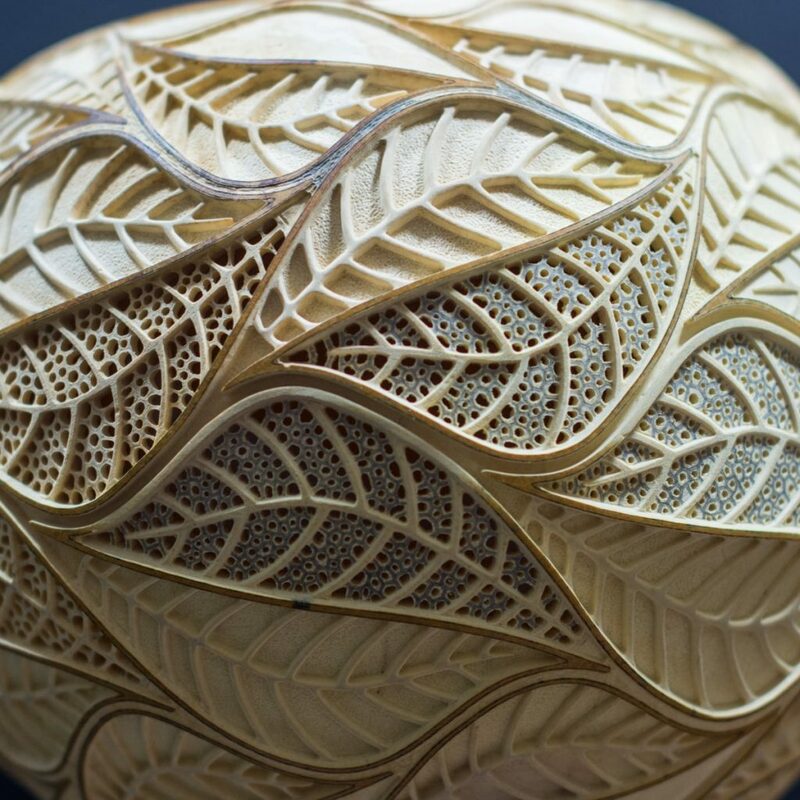 The veins of all the leaves are finished. Of course, not everything can be done by Presto. A lot of work I had to do by hand sanding. 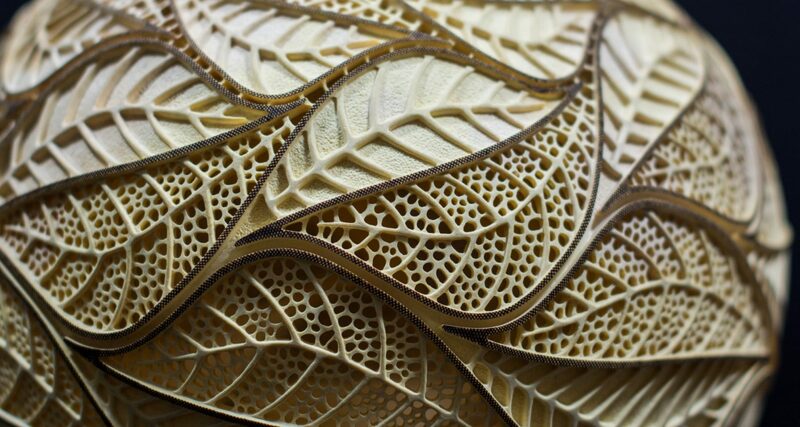 Now it’s time for carving the open-work perforation of the leaves which structure is based upon the Voronoi diagram. That was probably the most time-consuming part. 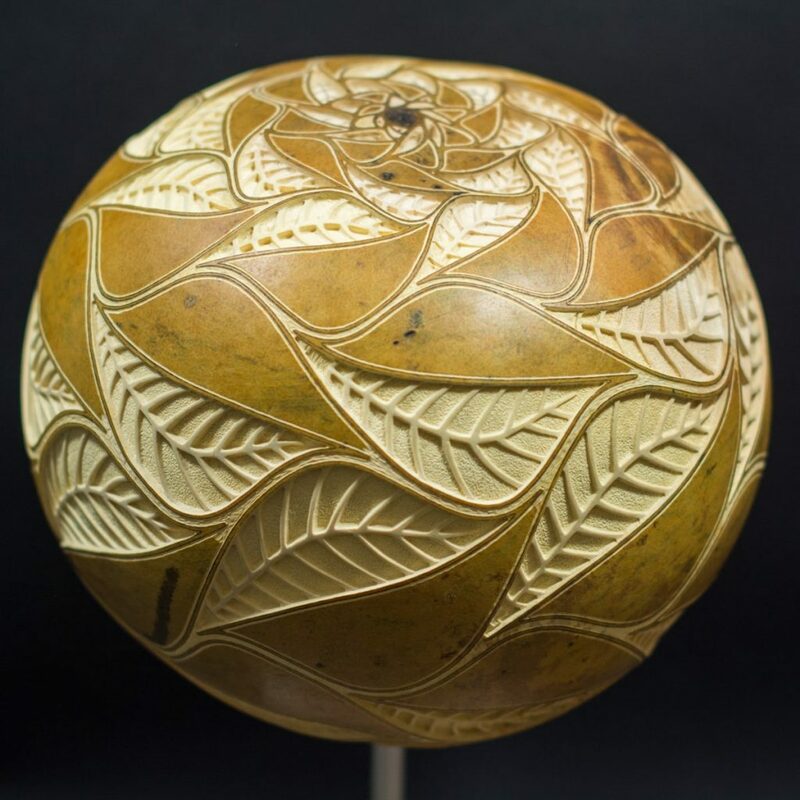 I love that look of the gourd in the process. Almost none of the original outer layer of the wood is left and it finally looks like the intricate sculpture. Now, all the details need to be sanded and finished. The wood on this stage is still raw. All the details are sanded, polished and they finally look beautiful. Next step is making the texture of the contours. It was made with a very precise wood burner (Razertip) and it’s been the first of my lamps where I have applied this technique. 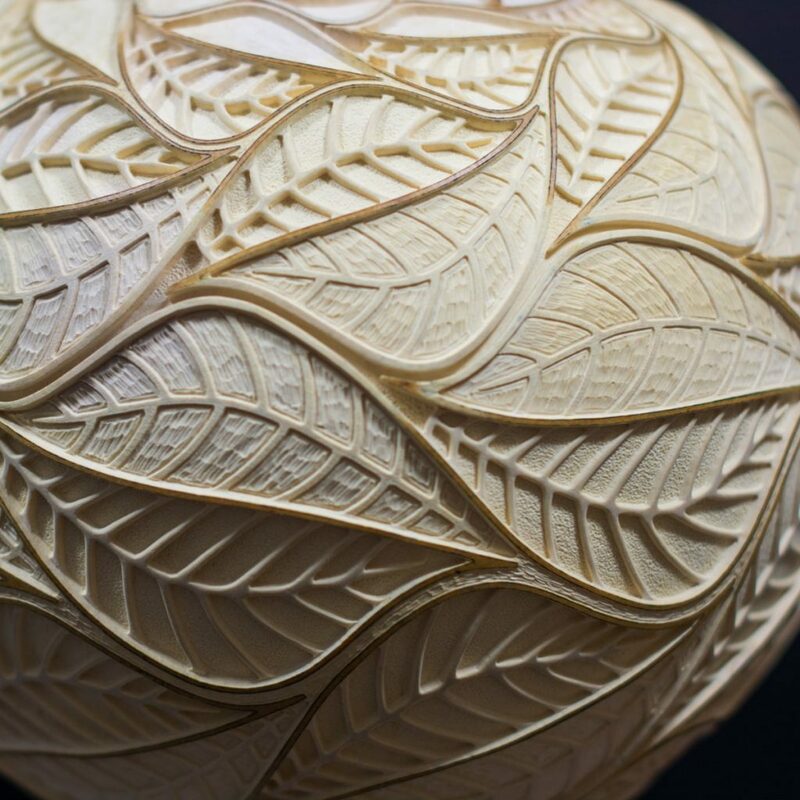 The last step of creating the head of the Escher’s Leaves is painting. 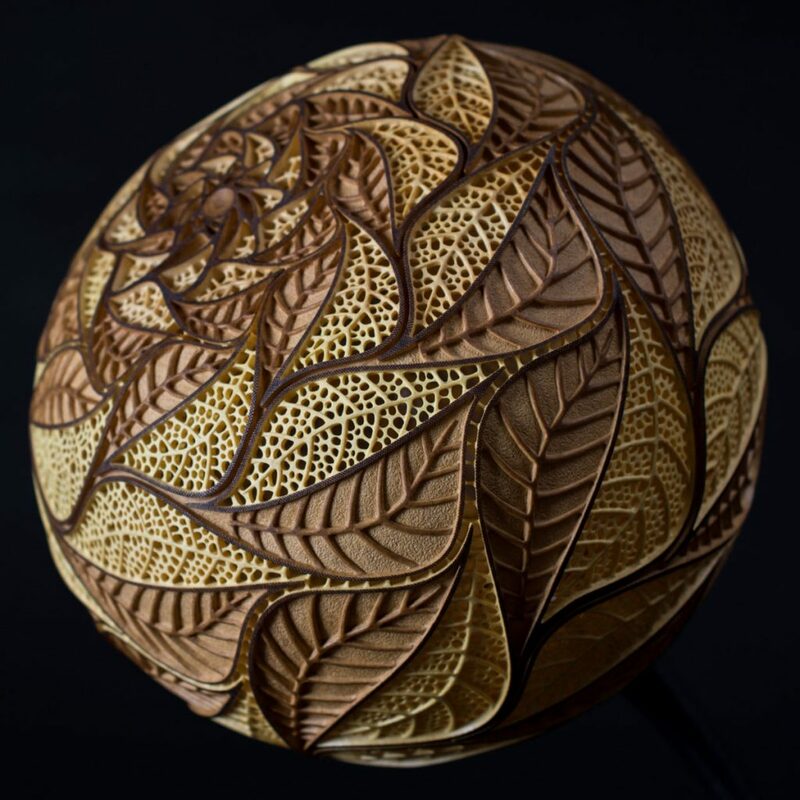 That is the first of my lamps where I decided to paint the carved thin wood. I have applied a very thin layer of the natural oil to make the desired color without the impact on its capability to transmit the light. 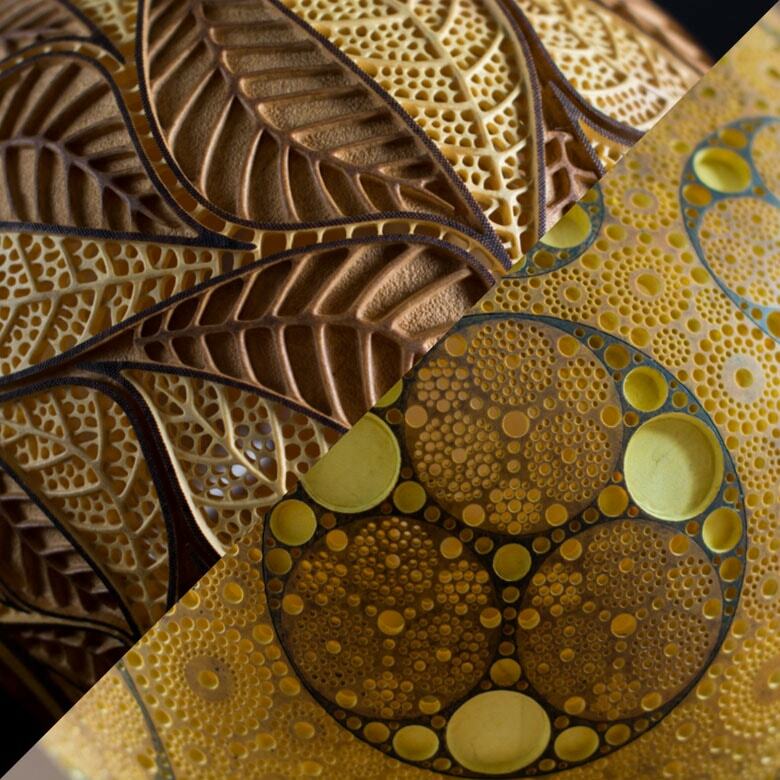 The dark contours with the texture were painted with dark oil and the perforation with the oil of natural color. 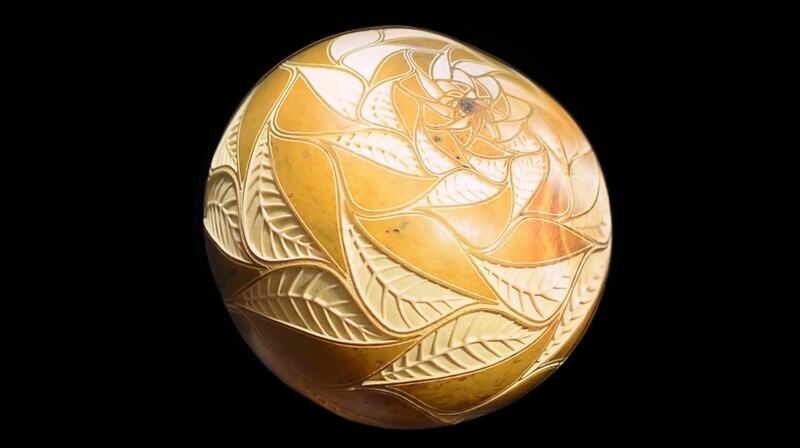 In the end, the whole gourd was protected with colorless varnish. 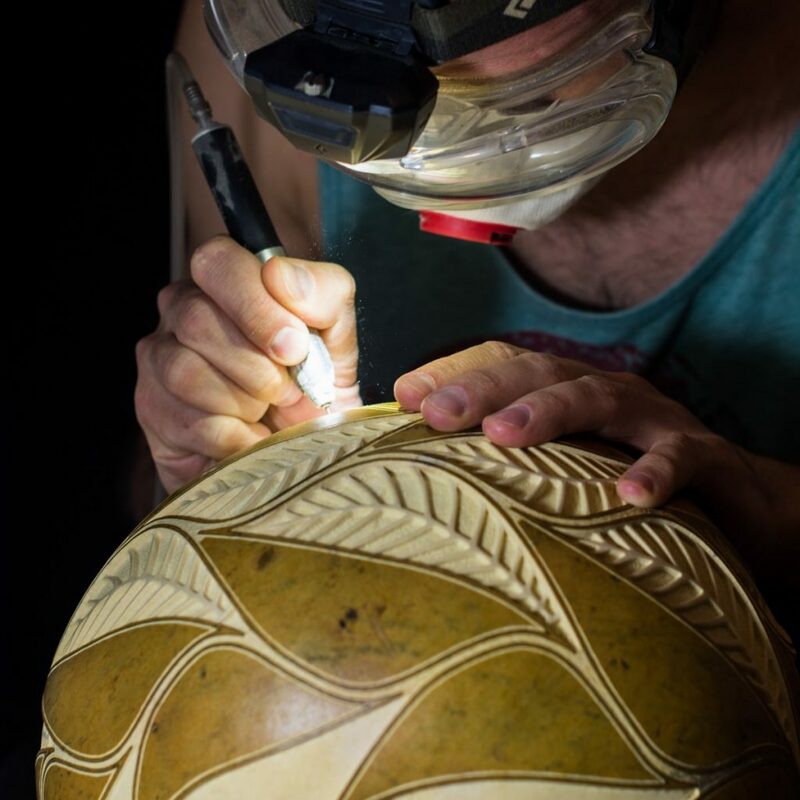 That is how the head of this handcrafted lamp was created. 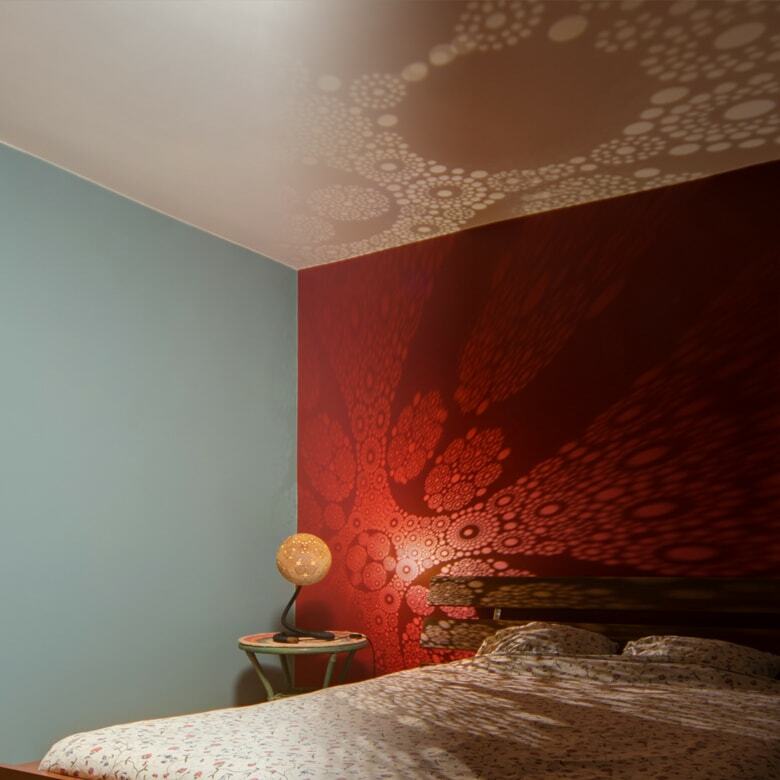 It was a huge challenge to me but creating this lamp gave me enormous satisfaction. 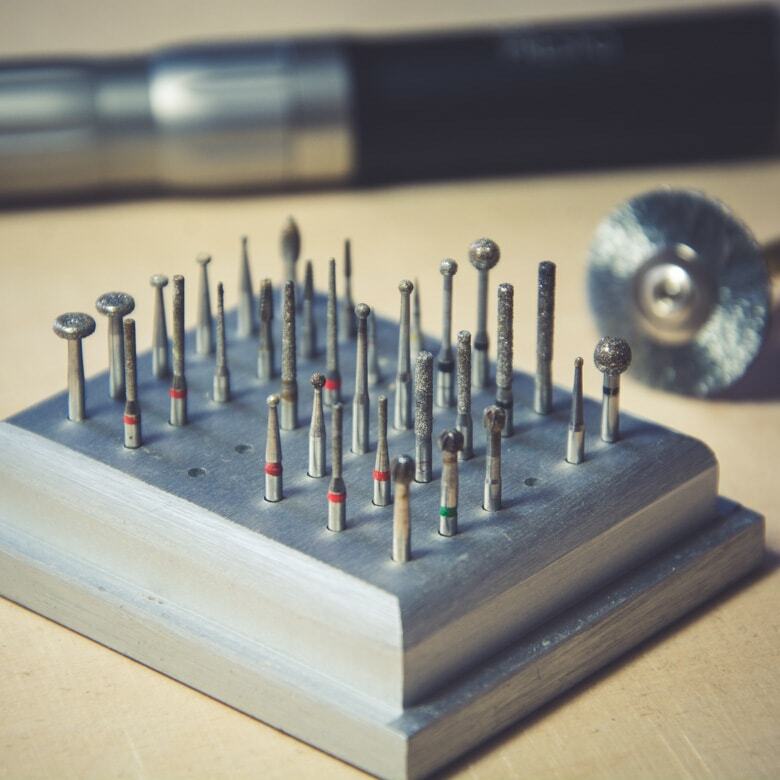 I have also learned a lot, both during the designing stage as while carving it. 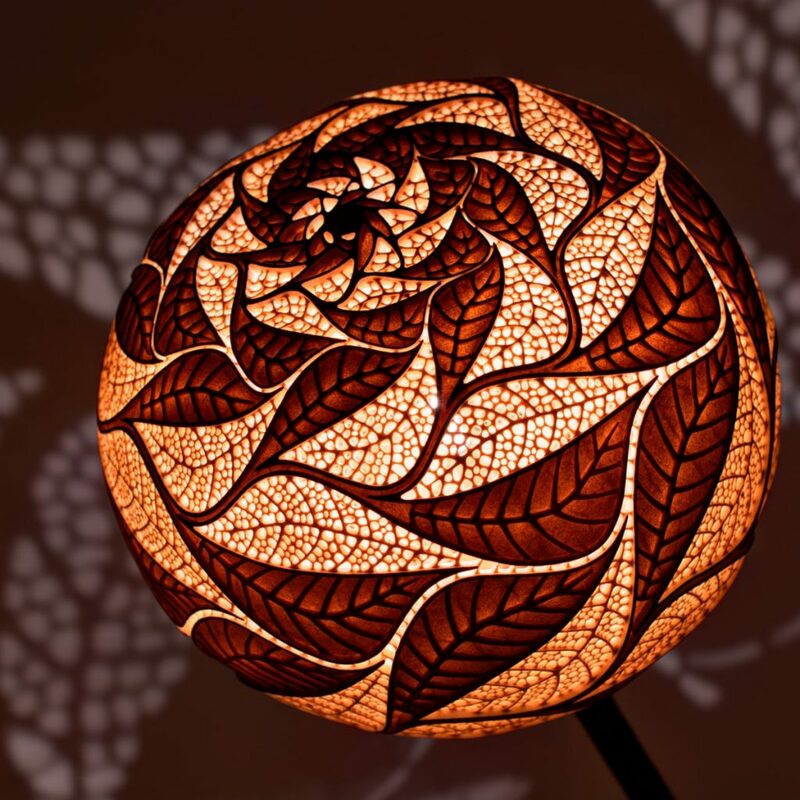 See the whole gallery of the Table lamp XXVII Escher’s Leaves.